With the emails and text messages which came to light this week implicating Christie’s top aides, but not directly providing evidence against Chris Christie, the outcome of this scandal might come down to public opinion. Documents clearly show evidence of corruption and an attempt at a cover-up. While it is far too soon to know if Christie will recover, I suspect that most people will either not be aware that the evidence does not prove direct involvement by Christie or will still believe Christie was involved. At very least, people will likely see him as creating the type of culture where such corruption exists, regardless of whether he ordered specific misdeeds. There remains the danger that a smoking gun will be found, or someone will talk, making criminal prosecution a possibility. There are other dangers for Christie. Being thought of as an incompetent leader who was unaware of what his top staff members were doing could be as damaging politically as being proven to have been involved. He might become a laughing stock even as details of the incident fade from the public’s mind. Late night comedians will continue jokes such as those I posted yesterday. 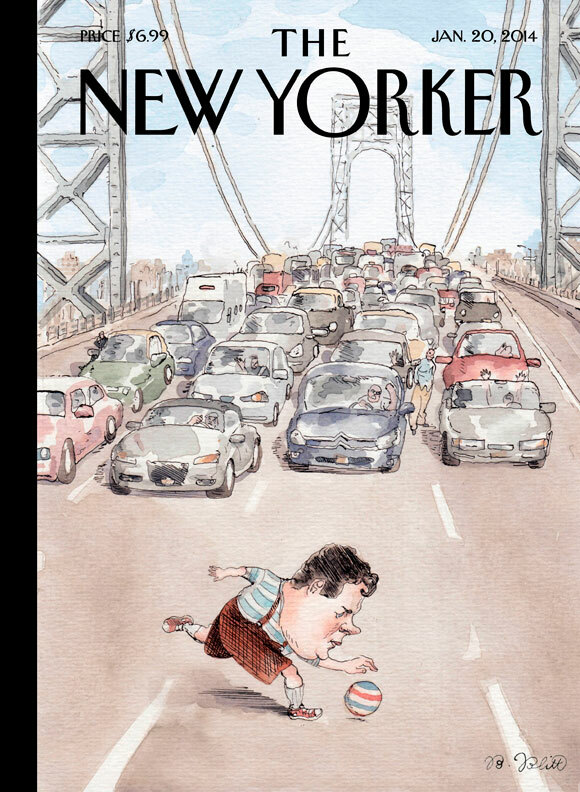 Images such as the one on the upcoming cover of The New Yorker of Christie playing in traffic will haunt him, and probably be even more damaging than pictures of Mitt Romney driving with his dog on top of the car or shaking an Etch A Sketch. Posted in Chris Christie, Humor and Satire, Mitt Romney, Scandals. Tags: Chris Christie, Mitt Romney. RSS feed for comments on this post.. TrackBack URL. Doesn’t seem to have done President Obama any harm! There’s no comparison to Obama here–unless you listen to the delusional rants from the far right. Of course Fox is trying to draw a comparison by dragging up topics such as Benghazi and the IRS long after their claims were debunked. With Obama, as compared to Christie, we have neither crimes committed by anyone on his top staff or any signs of incompetence. Then there was government organised gun-running to Mexican cartels, shovelling $zillions into Solyndra and countless other useless Greenie scams, the President interfering in judicial procedures following the arrest of ayoung man subsequently found ‘not guilty’, the IRS ‘investigation'(!) being handed over to a woman who has made maximum donations to, guess what?, the President’s re-election fund. Honestly, you couldn’t make it up! Sure you could make it up–the claims here, as twisted by the right wing noise machine, are so distorted that this is essentially a made up list if you are trying to compare this to the Christie scandal. For example, with the IRS scandal it turned out that both sides were reviewed–as they probably should have been considering that they were political organizations acting on the periphery of the law to get tax breaks, and it turned out to be left-wing groups which had their tax deductions denied. It was more a matter of poorly written tax laws which made such controversies inevitable. Obama did not appoint anyone to investigate. This was done through normal Justice Department channels.Even if the Justice Department did something wrong, and there is zero evidence that they did, an independently appointed employee of the Department of Justice is in no way comparable to Christie’s chief of staff. The Justice Department would be expected to be full of Democrats under a Democratic administration, such as they hire Republicans during a Republican administration. At least we aren’t seeing the type of pollicization now that we saw in the Bush years. Conservatives are distorting the facts to claim scandals when none exist. Fox and others outright make things up. Such dishonesty, concentration on creating false equivalences between widely different events, are common tactics of the right wing.